This morning, as I looked at my desktop and its excessive clutter of icons, my eyes were immediately drawn to places where I could form rows of three similar icons by swapping adjacent ones. This is a familiar phenomenon. You play a game, it trains your brain. It can feel like the game is taking over your mind, but I’d explain it in more benign terms: Visual pattern recognition is something we humans are highly optimized for, and a game as fundamentally abstract as this gives your brain patterns that it can spot in all sorts of places. It doesn’t know at first that it’s only supposed to look for the pattern in the context of the game, but it usually figures this out after a while. It isn’t even really a phenomenon limited to videogames. I experienced similar things when I was learning to play Go: I’d walk into a cinema, say, and see what seats were taken, and automatically decide where the next person should be seated to increase defensive strength most efficiently. There may be something about grids in particular that encourage this kind of thought. Grids are ubiquitous in both games and in our artificial modern environment, but they aren’t seen in nature. So I can imagine that the brain’s pattern recognition subroutines, having evolved to deal with natural things, would tend to see all grids as anomalies and thus as likely manifestations of the same thing. But this is pure speculation. Anyway, having just come off a stint of The Typing of the Dead, this all seems like more evidence of the medium’s underutilized potential as a training tool. If we’re going to be teaching our brains to do tricks, they might as well be useful tricks, no? Outside of combat, Puzzle Quest plays more or less like a conventional RPG, but one played on a scale I more associate with strategy games such as Heroes of Might and Magic or Master of Orion. All travel is conducted on an overland map, and constrained to delineated paths between cities and other important sites. Anything within a city is represented as a bunch of menus. You can acquire companions over the course of the story, but they’re not full characters with their own stats like the PC. Instead, they provide situational combat help, such as automatically doing 10 points of damage at the beginning of battle when fighting undead, or increasing your Battle rating by 10 when fighting Good characters 1No, you don’t have the option of turning evil, or at least not in the parts I’ve seen. But there are some knights who you have to defeat in friendly matches to prove your worthiness. — in other words, the sort of bonus you’d get from a Leader or Hero in a strategy game. There’s even the option of conquering the cities you come across and collecting tribute from them. Tribute is generated every game month, and to collect it, you have to visit the cities personally, just like certain strategy-game resource generators. All in all, the frame game might be better described, not as RPG, but as strategy game with just one hero stack. But then, strategy games of this sort share a lot of mechanics with RPGs — they have a common ancestry in miniature wargaming, and the seminal Heroes of Might and Magic series in particular was based on the Might and Magic RPG series. I mentioned conquering cities. This is done through the same tile-matching combat system as regular encounters, except that cities as opponents have a different special powers and different equipment slots: instead of one Helmet and one Armor and one Weapon, cities get one Tower and one Gate and so forth. Unfortunately, this game doesn’t support scavenging equipment from fallen foes. Otherwise, I would definitely try wearing an iron gate to my next encounter. You might think that conquering a city would be a big deal for the NPCs living there, but, in an extreme example of game/story orthogonality, no one seems to notice. At one point, I acquired a party member who gives a bonus during sieges, and he merrily helped me subjugate his home. At another point, I was on a diplomatic mission to a neighboring kingdom, trying to get their assistance against the undead hordes. On your first attempt at delivering your message, you’re turned away at the gate by a guard, even if you just laid siege to the place and conquered it. Now, to back up a step, you might be wondering where equipment comes from if there’s no scavenging. Well, there are quest rewards, and there are stores in the cities, and there’s crafting. Crafting is accomplished through tile-matching. But! It is different this time. There’s no opponent, you can’t use spells, and your goal is to delete a certain number of special “hammer and anvil” tiles (the required number depending on the power of the item you’re crafting) before running out of legal moves. There are a few other variants like this for other special actions, like researching new spells (delete a quota of each color, and also of special “Book” tiles that only appear when you delete a row of 4 or more) or training mounts (defeat the mount with a time limit on each move). My favorite such minigame is the one used for capturing creatures (so you can learn spells from them or use them as mounts), which is, to my mind, the only part of the game that really qualifies as a puzzle. You’re given an arrangement of tiles, but unlike all other occasions, it’s not random, it’s not full, and it doesn’t fill up. Your goal is to delete everything, which can be trickier than it sounds. 1. ↑ No, you don’t have the option of turning evil, or at least not in the parts I’ve seen. But there are some knights who you have to defeat in friendly matches to prove your worthiness. 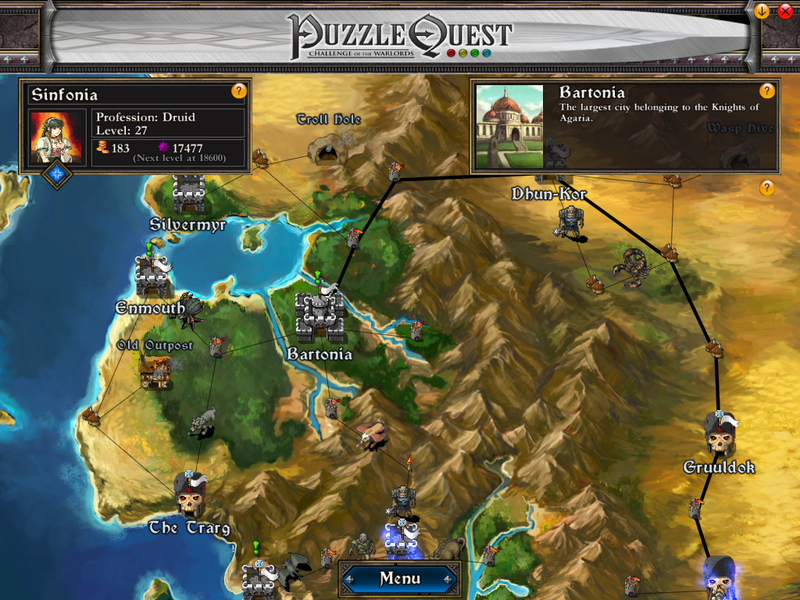 The heart of Puzzle Quest, the mode that you spend about 90% of your time in, is a competitive tile-matching game. There have been other competitive tile-matching games, such as Puzzle Fighter, but all others that I know of involve two players competing in realtime on separate playfields that affect each other indirectly at best. Here, we instead have the two players — or rather, the player and a computer opponent — taking turns in the same playfield. This alone has a profound effect on how the game is played. 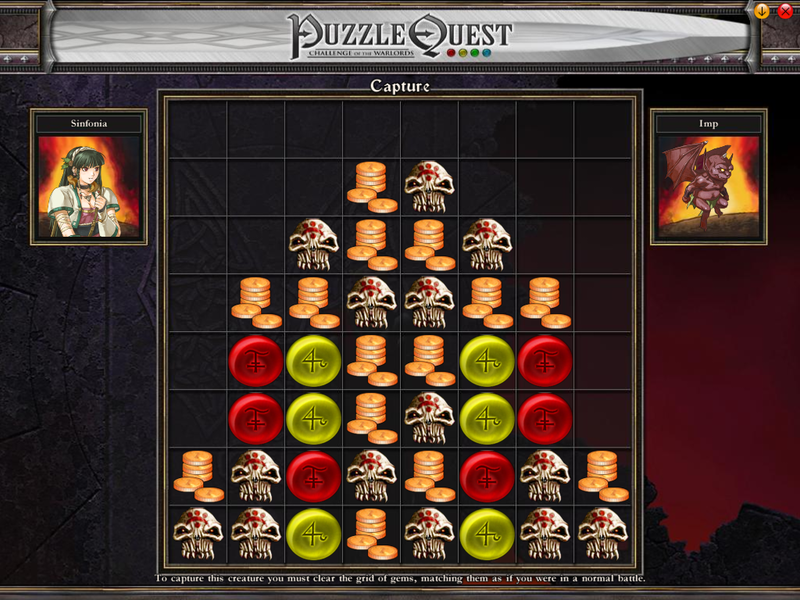 Normally, the player of a tile-matching game can expect to devote turns to setting up combos. But here, you actually want to avoid setting things up, lest your opponent take advantage of them before you can. There are ways to get multiple turns in a row — the simplest being to make four-in-a-row instead of three-in-a-row — but you can’t use such things most of the time. At root, the tile-matching works like Bejewelled: you swap two adjacent tiles in order to make at least one row of three or more, the matching tiles are deleted, and tiles fall downward to fill the empty spaces (possibly forming new matches and triggering a cascade of additional deletions). But instead of just increasing your score, the specific types of tile have different effects. Skull tiles do damage to the opponent when matched, and are the chief way you win combat, at least in the beginning. There are coin tiles which provide bonus cash and star tiles which provide bonus XP. The remaining four basic tile types provide you with four different colors of mana, corresponding to the four elements. With mana, you can cast spells. I find the spellcasting aspect very reminiscent of Magic: The Gathering. Like M:tG, there are a variety of effects, from direct damage to status effects to things that manipulate the board, changing tiles or deleting an entire row at a time or whatever. Like M:tG, mana color is important, and, while you can accomplish things more efficiently by specializing in a particular color, over-specializing makes you vulnerable. And, like M:tG, you can spend large portions of a match waiting for the colors you need to come up. In fact, fishing for mana is even more frustrating here than in M:tG, because of the way that the mana source is shared: you can spend turns waiting for more red tiles to come up so you can cast the direct damage spell that will win the match, only to have them come up at the end of your turn and be immediately grabbed by the opponent. I mentioned that specializing in a color makes things more efficient. This is mainy due to the Mastery skills. There are seven skills you can assign points to when your character levels, each increasing the benefits of one of the seven basic tile types. Raising your Fire Mastery skill, for example, will increase your red mana capacity, give you extra red mana for matching red tiles, and increase your chance of getting an extra turn when you match red tiles, thus making it possible to get red mana faster. So the more advanced your character is, the faster you tend to get mana in your areas of specialty. Eventually, this can make it more efficient to deal damage using spells than doing it directly with the skull tiles (unless you’re specializing in Battle, the skill that makes the skull tiles do more damage). I always find it satisfying when the rules of a game make the emergent strategies change over the course of play. The nice thing about this whole system is that it isn’t just tile-matching embedded in an RPG frame. The tile-matching affects the RPG and the RPG affects the tile-matching in a very tight loop. They are inseperable; each alters how you think about the other. The story, on the other hand, is just tacked on, and is pointedly ignored by the game mechanics in ways that I’ll describe in my next post. 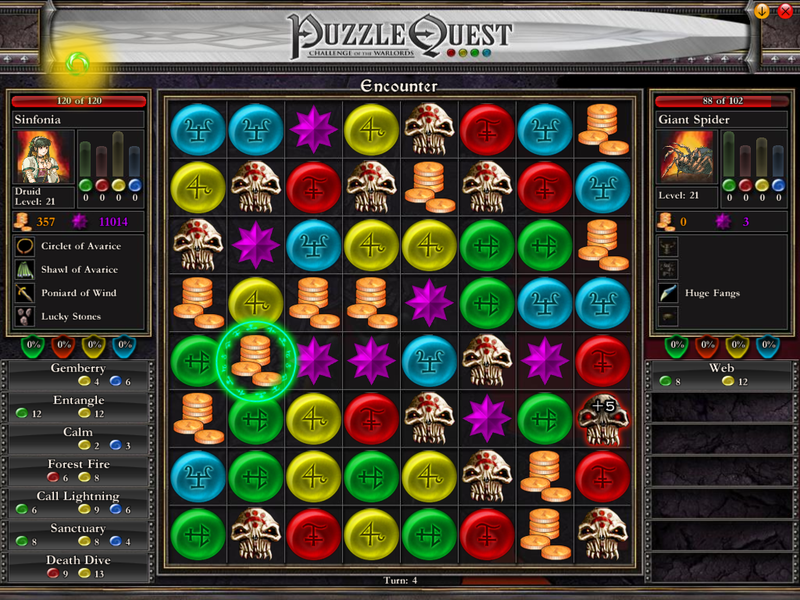 Puzzle Quest seems like the logical next step in our examination of nonstandard combat mechanics. Like Bookworm Adventures, it’s a RPGification of a casual game mechanic based mainly around pattern recognition, this time Bejewelled and other “match 3” games. Match 3 games are usually classified as puzzle games, even though they generally don’t contain what I personally think of as puzzles — which is to say, things where the player’s effort goes toward trying to figure out a solution. Presumably it’s because their lineage can be traced back to Tetris, and thus to polyominoes and other assembly puzzles. But before I go into the gameplay, I’d like to talk about distribution channels. This is a game that’s available both on physical media and through online download, as is increasingly often the case. In the past, I’ve preferred to get games on discs where possible, but I’ve been rethinking this lately. On the one hand, physical discs give a greater illusion of permanence, which is important to those of us who like to play old games. There are discs on the Stack that I’ve had for more than 15 years. I don’t think I still have any downloadable installers that old on my system (and yes, such things did exist back then, mainly for shareware titles), nor the means to re-download them from their now-mostly-defunct publishers. On the other hand, my still-green experiences with long-distance moving have taught me how easy it is for physical objects to get lost, and Steam is making downloads seem like a more solid prospect, by making downloads from multiple publishers available under a single account that you’re less likely to forget about, and by being less likely to go out of business soon than a single indie publisher. 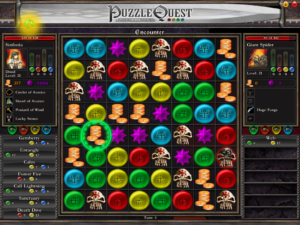 Now, Puzzle Quest can be obtained through Steam, but also through other online distributors. So it clearly doesn’t require Steam activation (although for all I know the Steam version might require activation anyway; if the process is fast and automatic, you wouldn’t necessarily notice it happening). Still, I chose Steam, mainly because I would otherwise face the inconvenience of creating an account on some other system. And when you think about it, that includes most online stores where you could buy the physical-media version. So Steam is basically the iTunes model, providing enough convenience that you’ll use it in preference to other channels. I’m wary that they’ll abuse this power, like any DRM-enabled distributor seems to do eventually, but not wary enough to resist being sucked in. 1. ↑ Software retailers just aren’t as dense in San Francisco as they are in Manhattan. Before the move, there were four within my customary orbit. In the final level of The Typing of the Dead, the rotting corpses give way to what look more like artificial life forms or androids, grey-skinned and sporting built-in lightsabres and other superpowers. The advanced tech doesn’t stop them from just standing there like ninnies and letting you type at them for a while before they attack, though. That’s just essential to the way the game is played, especially since the phrases you type are getting pretty long by that point, but it fit the zombies better, because you expect zombies to react slowly. 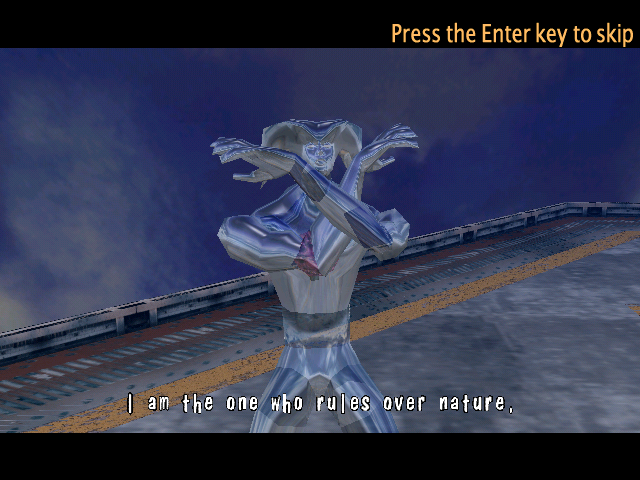 The end boss, the Emperor (the bosses are all named for tarot cards), is even more artificial-looking, a demon made of clear plastic. According to its creator (in an unbelievably awkwardly-dubbed cutscene), it was engineered to solve the world’s ecological crisis by ruling over humanity. Maybe this was less stupid in the original Japanese, maybe not. Some people have said that the schlockiness of the House of the Dead 2 material complements the game’s campy and self-mocking sense of humor. I just say that the cutscenes are not a significant part of the experience, and skippable. The first time I reached this point of the game, I had only a few remaining lives, which Emperor Perspex quickly removed. 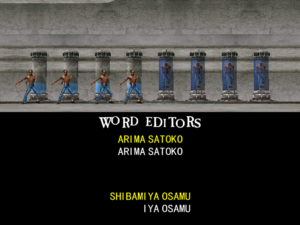 The game does some dynamic difficulty adjustment, at least for bosses: after you get killed a few times in succession, it starts using easier words. But in order to take advantage of this, you need lives to waste. So after my first attempt, I resolved to earn enough coins to play with 9 continues instead of 5. There are five coins to be earned on each level, and each of the five is earned in a different way. You can make it easier to get particular coins by adjusting your approach to the game. For example, one coin on each level is earned by completing the level without any continues, and is most easily earned by setting the difficulty level to “Very Easy” and giving your top priority to avoiding damage, even if it means letting civilians die. Another is earned for scoring above a certain threshhold (the threshhold varies from level to level). This is best accomplished by setting the difficulty to “Very Hard” — which confers some kind of score bonus — and giving the civilians top priority — who cares if you lose lives yourself, saving those guys is worth a lot of points! A third coin comes from getting an “A” rating on a certain number of words. Ratings are based on how fast you type, but only the time from when type the first letter counts. So getting lots of A’s involves refraining from initiating attacks until you’re ready to type an entire word in a burst, which can mean ignoring both your health and the civilians. This kind of strategizing may be missing the point of the game: you’re supposed to win through typing prowess, not through gaming the system. But it kept me interested enough to keep on playing, by giving me goals to strive for that seemed easier than trying to fight Emperor Plexiglass again. When I had my 9 continues, I made another run for the end. Ironically, by then I’d had enough practice that I only needed 4. 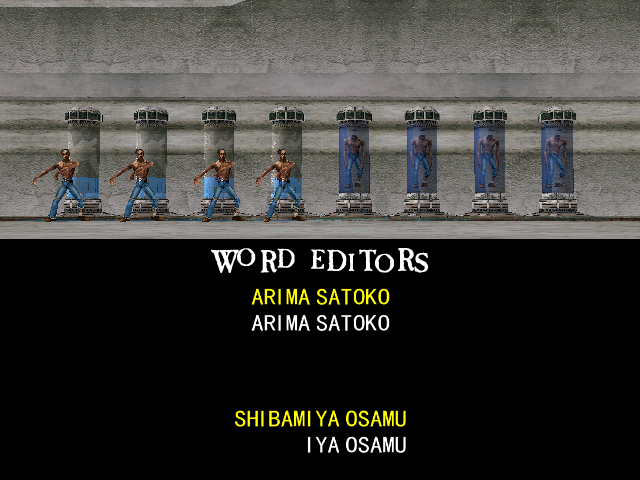 After the ending, there’s an interactive credits sequence: as the names of the developers scroll by, you can type them. Typing an entire section of the credits before it scrolls away releases a zombie from a bacta tank, and the released zombies dance to the background music, forming a chorus line of the dead. I found this bonus segment unexpectedly difficult, because the names are mostly Japanese, and Japanese uses different letter patterns than those the game trains you in — not many English words contain the sequence “ryo”, for example. 1The only one that comes to mind immediately is “cryogenic”. Anyway, the game works! I can totally touch-type now, with punctuation and everything! It’s pleasing to be able to take a skill away from this experience; somehow, it’s always the weird games that are life-changing. Any game with a twitch element teaches you a skill, really, but usually it’s a skill that’s only applicable in playing that game, or sometimes other similar games. And this is definitely a twitch game — when I was at my best, I was typing from my brainstem. When I was at my worst, I was flailing at the keyboard madly, too panicked to see what I was doing wrong (usually something stupid like still trying to find a key I had already typed). That sense of panic, and the ability to overcome it, is something that you just don’t get from ordinary typing practice. I’d guess that even Mavis Beacon doesn’t provide it. No, if you really want to learn to type, what you need is zombies. Seriously. 1. ↑ The only one that comes to mind immediately is “cryogenic”. You can see the game’s arcade roots in the PC version: there’s no notion of saving or even quitting the game (the docs actually tell you to use alt-F4 to exit! ), and, as is often the case in arcade ports, it uses the concept of “Continues” as a substitute for inserting another coin. By default, you get five continues, each containing three lives. You can get more lives within the game by various means (such as rescuing civilians), but there’s no way to get more continues, short of starting over. You can play the game in two modes: Arcade mode and Original mode. I found this use of the word “original” confusing — it doesn’t mean “This is the form the game had originally”, which more accurately describes Arcade mode, but rather “This mode is original to this version of the game”. Original mode complexifies things a little. It adds a simple inventory system — bonus items such as molotov cocktails that you trigger with the function keys. More importantly, it has a system of rewards for achievements such as completing a level without using any continues, or getting above a certain number of points. Each such achievement gives you a “coin”, and certain special options are unlocked by collecting coins. At 5 coins, you can set it to give you five lives per continue instead of three. At 15 coins, you can use nine continues in a game instead of five. 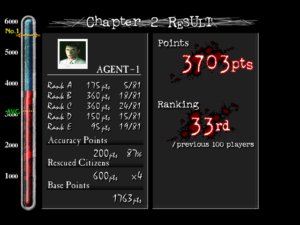 Now, I’ve managed to get to the final level of this game, the Umbrella Corporation-like corporate laboratory that created the zombie plague. And I have my doubts about whether I’ll be able to defeat the end boss under the game’s normal parameters. I may need those extra four continues. So I’m asking myself how honorable this is. On the one hand, it’s kind of like cheat codes. On the other hand, it’s something you have to earn, and even having it doesn’t guarantee that you’ll win the game. If you can’t type fast enough to swat down the final boss’s missiles before they get you, all the continues in the world won’t help you. Ultimately, it’ll probably depend on how bored I get. The game isn’t terribly long — another relic of its arcade origin — and so, while there’s some variability of content (depending on which people you manage to rescue), playing this game largely means seeing the same things over and over again. Which is, to be fair, the point. The whole thing is a drill. I assume this game would be easy for someone who already knows how to touch-type. I can imagine a professional typist breezing through the whole thing on their first try without losing a single life. I personally never learned touch-typing, and had no real intention of doing so. Like many computer users, I had developed a certain amount of familiarity with the keyboard simply through using it a lot, and considered that adequate. I bought this game for its novelty, not its educational value. That’s why I set it aside for so long. In fact, to the extent that I ever thought about it, I always more or less assumed that I was pretty close to being a touch-typist just from practice. It wasn’t until I started playing this game, years ago, that I understood how wrong I was. You just don’t notice how frequently you look at your hands to reposition them. Like blinking, it’s not something you’re aware of doing. Not until you try to refrain from doing it. 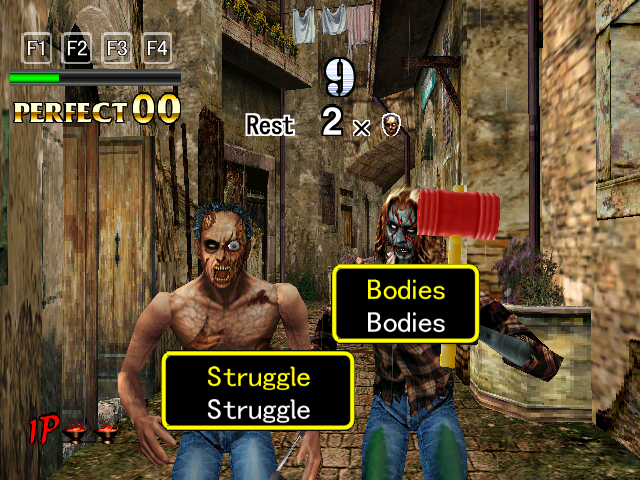 Even apart from the mere presence of zombies, the game uses various tricks to punish you for looking away from the screen, such as bonus items that you can collect by pressing the right single key during the fraction of a second they’re available, and a trick boss on level 2 that goes through invulnerable phases where your keystrokes have no effect. Typing the way I had been typing was a handicap in these situations. Still, I wasn’t terribly interested in learning to type properly. The only practical advantage I see to it is that it lets you keep your hands under a blanket while you blog on a cold winter night. So I really only took an interest in trying to touch-type when I realized that I’d eventually want to beat this game in order to remove it from the Stack. Well, the game contains some basic tutorials explaining the home position and which fingers go with which keys. With this knowledge, all I needed was practice. And so, for more than a year now, I’ve been going about things backward, trying to touch-type in my day-to-day life in order to be better at this stupid game. But I suppose that an educational game is working if you wind up educated because of it, regardless of exactly how it happens, and I can assert that it’s been something of a success. I’m still far from the skill level of my hypothetical professional typist, but I’m doing a lot better than I was the last time I had this game installed. 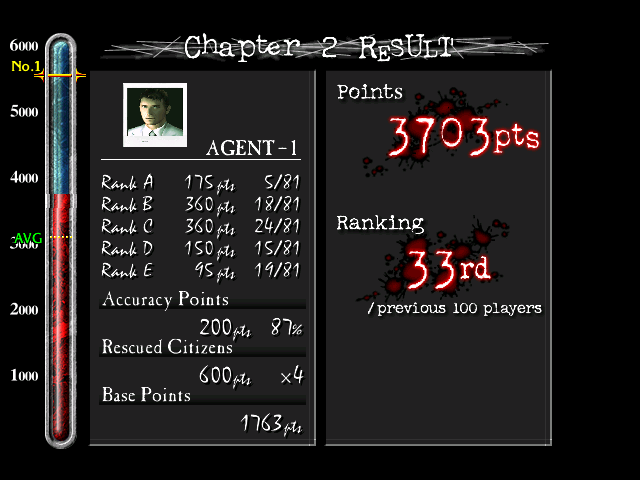 The scoring screens displayed after every level have me pegged at just above average right now. And while we’re talking about words as weapons, I really should bring this one out. 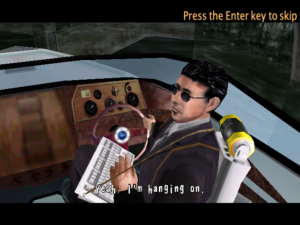 One of the most absurdly-conceived educational games ever, The Typing of the Dead is a rail shooter — specifically, House of the Dead 2 — transformed into a typing tutor. Zombies stagger out labelled with words; typing the words damages them, with a gunshot sound accompanying each keystroke. The genius of this is that it naturally encourages touch-typing: you don’t dare look down at the keyboard when there are zombies shambling toward you, and there are as many in-game motivations to type quickly and accurately as there are to shoot quickly and accurately in the original game. The most completely brilliant thing about it, though, is that this change in the world model carries through to the character models. Everyone who has a gun in House of the Dead 2 instead has a keyboard strapped to their chest, connected to a Sega Dreamcast on their back (even in the PC port). You don’t normally see your own shots being fired, but there are some cutscenes where you can see NPCs typing the zombies to pieces. The fact that it was originally a Dreamcast game actually poses some problems for the modern PC gamer. Many console ports from that era use graphics with palettized texture maps, which is something that’s been dropped from recent graphics cards. So much for Direct3D backward-compatibility! Playing this game with my ATI card makes the game revert to software rendering, which is not just slow and low-res, it’s glitchy. Transparency in textures seems to just not work at all. I’ve solved the problem by reinstalling my previous graphics card, the nVidia one. I had given up on this card because of its inability to handle recent games well, but it seems to do alright with something this old. (Also, having inspected it again, I have some suspicion that its only problem was overheating due to parts of the heatsink being clogged with dust.) It looks like I may be doing a lot of card-swapping in the future, as the Stack contains games that are incompatible with either card. Or maybe I should just clear all the console ports of that generation from the Stack at once. Anyway, even though it shares a basic conceit with Bookworm Adventures, it’s not really the same type of game at all. 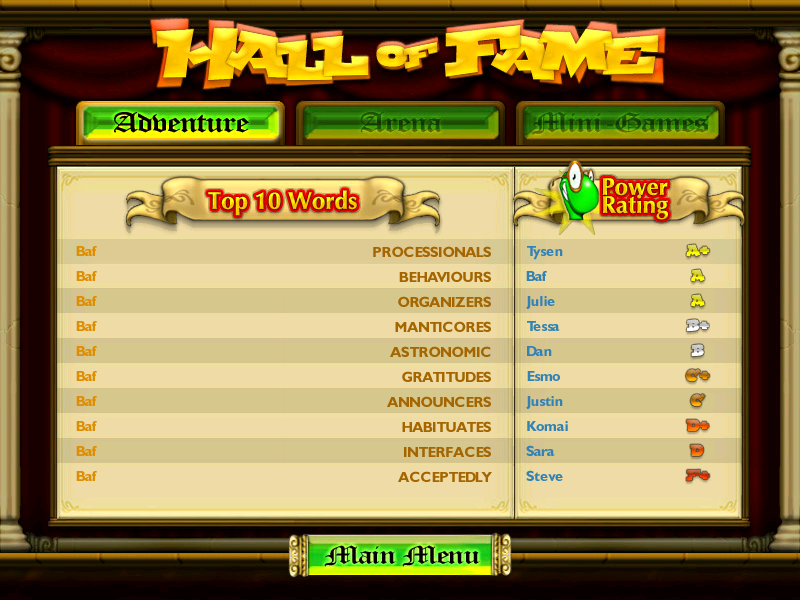 Bookworm Adventures is turn-based, and asks you to come up with the killing words on your own, thus rewarding people with large vocabularies (both in the sense of vocabularies containing many words and in the sense of vocabularies containing large words). 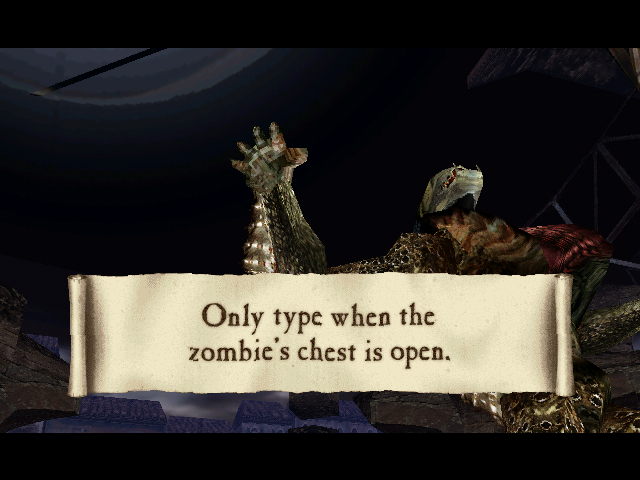 The Typing of the Dead is all about reflexes, and always tells you exactly what you should type. Bookworm Adventures is a pretty short game. It has three chapters (themed on Greek mythology, Arabian Nights stories, and classic horror — all it needs is a generic fantasy/fairy tale chapter and an African chapter and it would be the Quest for Glory series). I completed one chapter per session. I’m not sure how to feel about this. On the one hand, I’m not a fan of padding games out unnecessarily. This game demonstrates all of the special attributes monsters can have — attack side-effects, defensive powers, vulnerabilities to particular categories of word — and once the game is out of new tricks, it doesn’t overstay its welcome. On the other hand, padding things out is largely what RPGs do. It somehow seems wrong to keep it short. It may have been designed this way because PopCap is more comfortable with the casual stuff, and regarded Adventure mode as a mere introduction to the real meat of the game, Arena mode, which is unlocked when you finish the plot. In Arena mode, you challenge the various boss monsters again, starting over at experience level 1, but with all of the game’s magic items available. There are changes in how you acquire potions and how experience points are earned, but the main difference is that Arena mode is realtime. So much for sedate gameplay and falling asleep mid-battle. I don’t really care for Arena mode: much of the pleasure in Adventure mode came from searching for the very best word that the available tiles could make, and you just don’t have time for that when the enemy is killing you whether you play or not. Instead, you have to play whatever mediocre words you can find quickly. It’s probably more interesting to watch than Adventure mode, though, in which (as I played it, at least) the player spends a lot of time just staring at the screen without doing anything. Two nights now, I have played Bookworm Adventures. And two nights have I fallen asleep playing it. That’s sort of a double-edged thing to say. If it were a movie or a play, to say “I fell asleep” would be to call it boring. But in games, there’s the “I kept playing until I dropped from exhaustion” option. And honestly, it was a little of both in this case. If it were genuinely boring, I wouldn’t have kept playing even as I began to nod off. But it’s hardly exciting, either. It’s sedate. The background music is as comfortable and child-friendly as a lullaby, and the character animation consists mostly of things rocking gently in place. Aside from some optional time-limited minigames you can play for extra potions and gem tiles, it’s completely turn-based. And, since knowing what happened on previous turns doesn’t really help you much, you can actually doze off repeatedly during play without your performance suffering much. Still, my mental state meant that I didn’t really process the plot at the beginning of chapter 2, when my first session ended. When I came back to the game the next day, I had no idea who the player character was talking to or how they met. The story element in this game is pretty light, though, and doesn’t affect player decisions at all; mainly it’s just a series of excuses to put you through different monster themes. Which is not to say that it’s bad — the whole thing was written by Stephen “Bob the Angry Flower“ Notley, and is full of his sense of humor. It’s more G-rated than Bob, and I’d almost say it’s less gratuitously absurdist, but then I remember that it’s a story about a worm in spectacles who fights legendary monsters inside books.